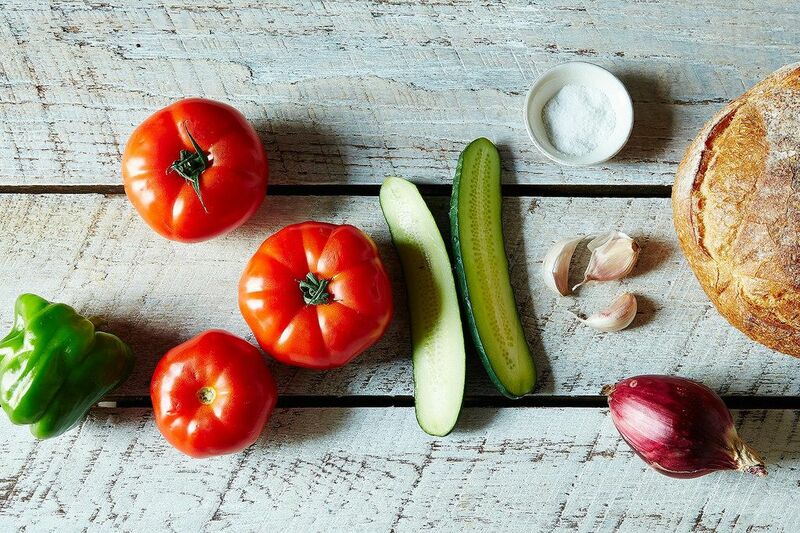 Today: Turn stale bread and rogue produce into a cool, refreshing gazpacho -- all without a recipe. Remember that time about, oh, six months ago, when we all waxed poetic about balmy June days and lingering August nights from beneath our winter coats? It’s true -- summer came not a day too soon. But perhaps we all need a reminder of its early thrills now that it’s hot enough that we’re tempted to forgo simply adorned tomatoes and corn in favor of ice pops for dinner. When you’re throwing open the refrigerator door purely for the blast of frigid air it gives you -- when the thought of food feels heavy and sticky -- gazpacho will be your relief. 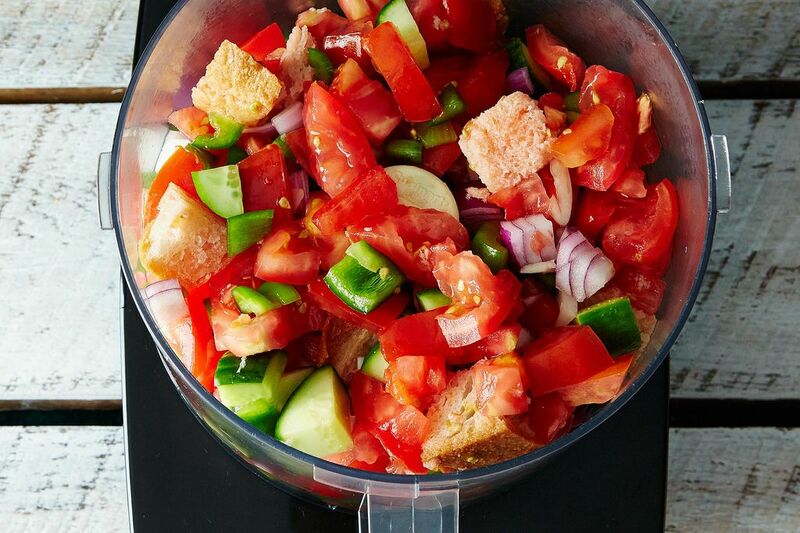 More: Same ingredients for forks, not spoons -- try Gazpacho Panzanella. 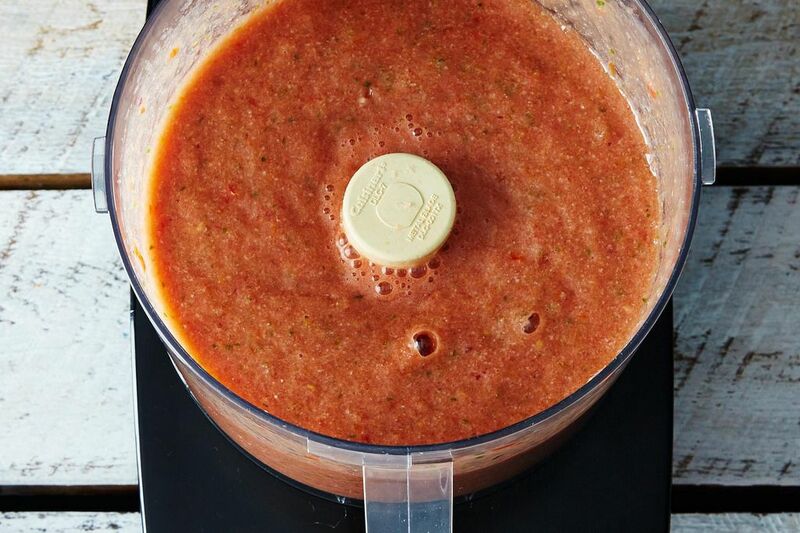 Best of all, you need little more than rudimentary blender proficiency -- no, not even a recipe -- to make a five-star gazpacho. Here’s how to do it. 1. Gather the troops. 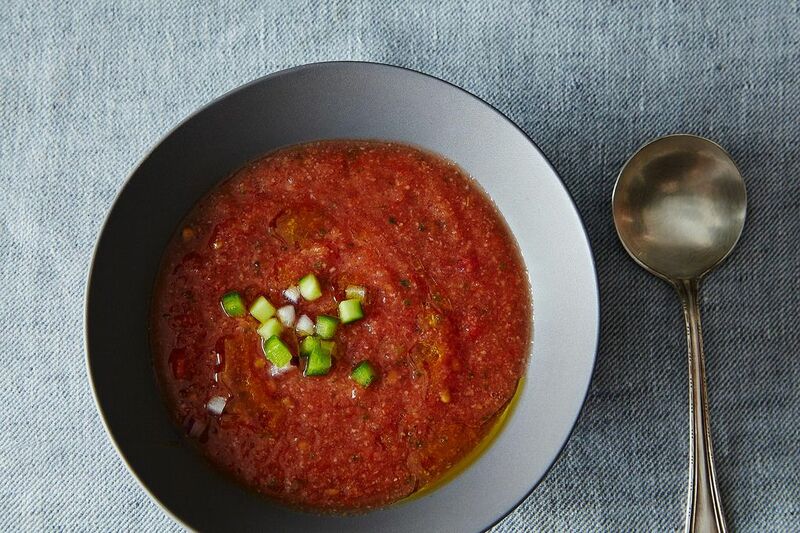 For tomato gazpacho, you'll want about 6 cups of chopped tomatoes. Just as important are the supporting actors: cucumber, bell pepper, and red onion. Go for about one of each (or less onion, if it's a big one). Next, of course, is the garlic, of which you should add at least 2 cloves but feel no need to stop there. Two thick slices of stale bread give the soup body and provide taxonomic distinction from salsa. Look further and you'll see an unkempt summer garden's worth of possibilities. 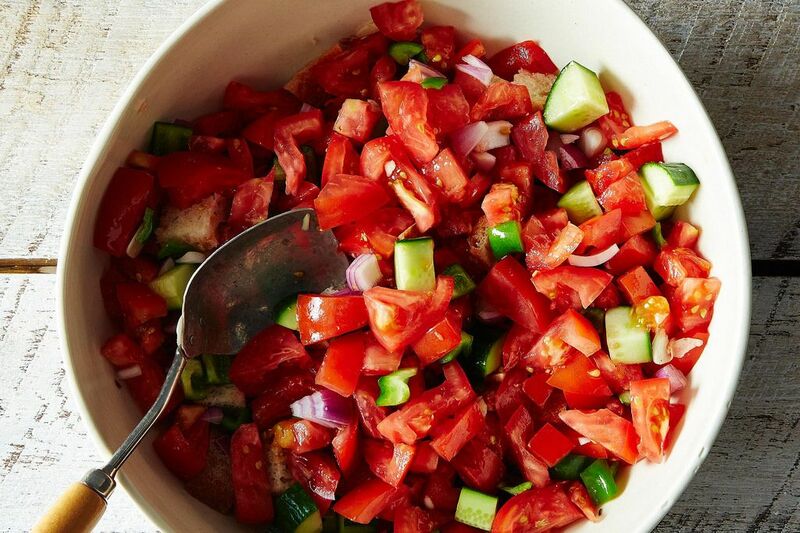 A good rule of thumb: If the vegetables pair well in a salad, they'll probably pair well here. Another one: When in doubt, color-coordinate. Whiz zucchini with basil, summer squash with corn, watermelon or strawberries with red bell pepper. Toss in a jalapeño or habañero wherever you'd like heat, a good squeeze of lemon or lime where you want acidity, and a half or whole avocado where you want creaminess. Fresh herbs are a magnificent idea. More: No need for another tool to take up more counter space -- here's how to juice a lemon without a reamer. 2. Give everything a rough chop. You're just getting it ready to purée, so no need to break out the ninja knife skills unless they bring you joy. Layer everything in a big bowl with the bread at the bottom to soak everything up. If you want a chunkier soup, now's the time to reserve about one-fourth of the vegetables. Toss everything with 2 teaspoons of salt, cover the bowl, and let it sit for at least 30 minutes -- a couple hours is even better -- while the juices do their thing. 3. Purée everything in a food processor or blender, working in batches if necessary. More: While you have your food processor out, make some falafel to go with your gazpacho. 4. Drizzle in olive oil, which makes the soup smooth and slinky. A full cup is good, but you can get away with less. Chase it with 1/4 cup or so of sherry vinegar or red wine vinegar. And, if you really want to trick out your soup, add about 1 teaspoon of any spices you like -- cumin and smoked paprika are both stunners. Purée again and add salt to taste. 5. 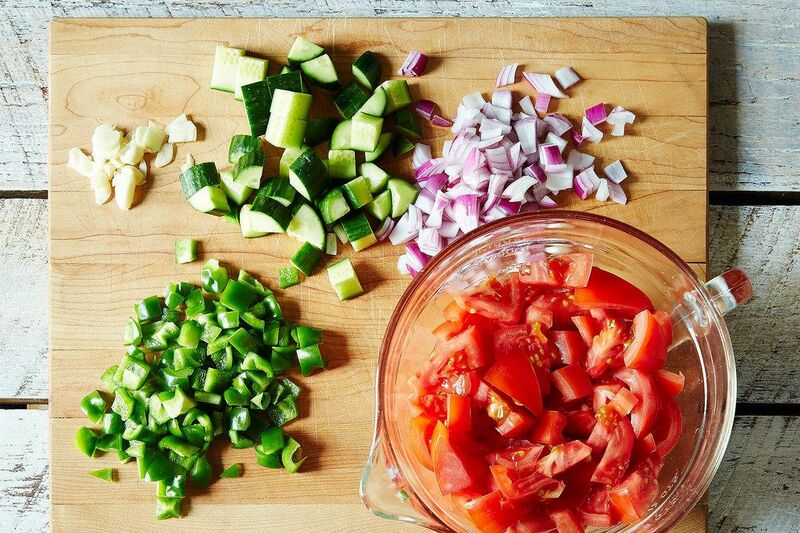 If you reserved any vegetables, chop them again, this time more finely and evenly, and stir them into the soup. If, on the contrary, you prefer a soup that's silky and smooth, pass it through a fine-mesh strainer. Or just eat it as is.